Hi everyone! 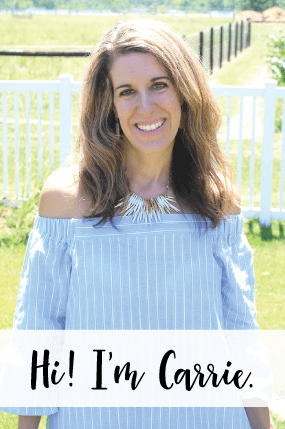 I am really excited to share with you one of my Master Bathroom decorating projects today. 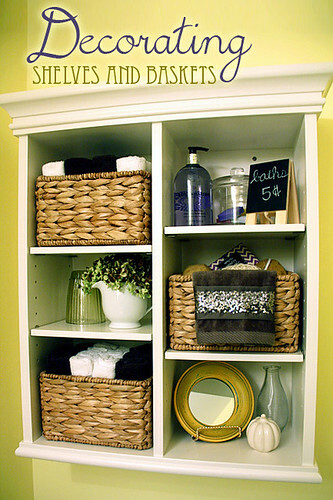 I finally broke down and bought this beautiful white cabinet from Pottery Barn that holds baskets. It was a little pricey, yes… but, OH… it is GORGEOUS. And, I had SO much fun decorating it. I told Brian tonight that I just love decorating, it is so much fun. Ahhh, now if I can just get myself to finish everything else I want to do in the Master Bathroom. I have a list and I’m checking things off, so stay tuned for some more decorating posts in the near future! I went to a several stores to buy everything I used to decorate the cabinet with: Home Goods (of course! 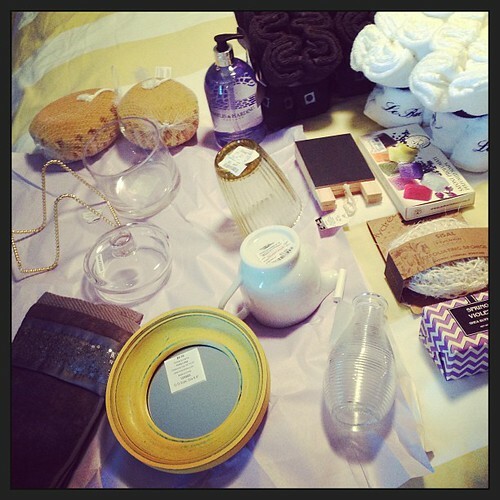 ), Hobby Lobby, TJMaxx and Target. I actually drew up a sketch of what I wanted on each shelf before I went, then looked for these items in the stores. Basically I drew a short vase/short object, chalkboard sign, towels go here and here, etc. Then when I got home I laid EVERYTHING out on the bed and went to town with decorating the shelves and baskets. So fun! Each little space on this shelf turned out wonderfully… so, I wanted to show you some detail shots. I wanted to stick with the colors white, yellow, grey with accents of purple. 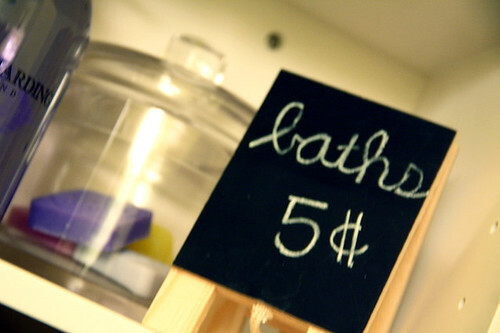 On this shelf I purchased a big bottle of bath wash in purple, then I filled a tiny glass container with a lid with tiny little square colored soaps… my favorite part of this shelf is a little chalkboard easel that says ‘baths 5 cents’ on it. On this shelf, I purchased a white pitcher that I plan to put fresh cuttings in. 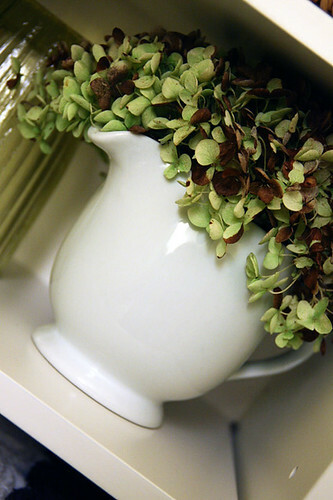 I have a limelight hydrangea that I took a fresh cutting from to put in the pitcher. I kept this shelf pretty simple, since I want the focus to be on the cutting in the pitcher. The only other piece on this shelf is a yellow cup that I turned over since I didn’t want to put anything in it… It has a little texture to it and looks beautiful on its own. 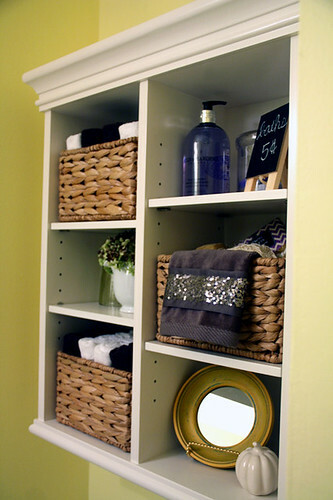 For the middle shelf, I wanted to do something special with the basket and had planned to buy a monogrammed wash cloth. 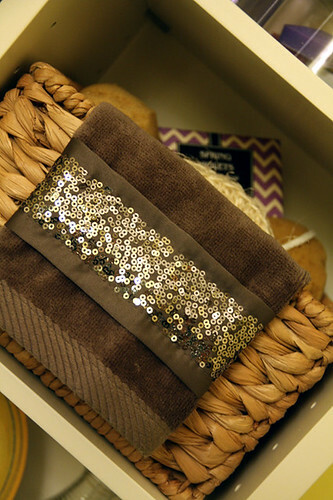 HOWEVER, I saw this beautiful grey towel with sequins on it at Home Goods and that sealed the deal for me. I bought several large sponges, some hand sponges and a bar of soap that has a purple chevron wraper over it to put in the basket. 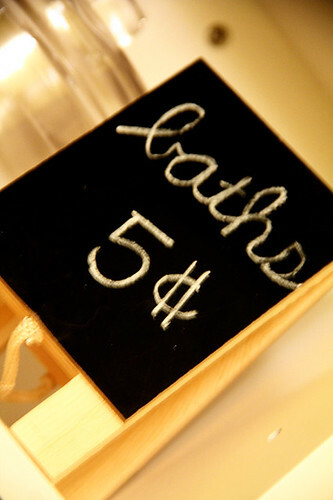 Wash cloths are not cheap, I found this out really quick… at least, not soft and fluffy ones. They were around $3.50-$5.00 A PIECE at Home Goods and Target even! Home Goods and Target had some that were $2 ea., but they were way cheap and thin! Yuck! So, I scoured the aisles at Home Goods and found these bundles of towels in 6 packs for $8.00! That is $1.33 a piece! They even had GREY bundles and white, both colors that I needed for the baskets! The master bedroom bedding is from West Elm and is white/yellow and grey/white stripes, so I wanted to do one basket with 2 rows of grey towels in between 1 row on each side of white towels, then the opposite of that on the bottom basket. Does that make sense? 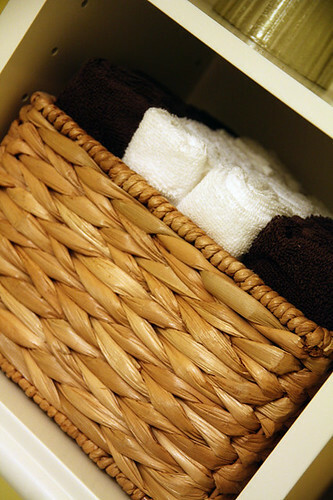 If not, look at the photos of the top and bottom baskets at the top of this blog post. The only catch to these towels is that they have French writing on them, but it is on the bottom of the towel so you can’t see it since the basket covers it. Also, the grey towels are a LITTLE too dark of a grey (I wanted it to be a bit of a softer shade of grey), but… at that price, who cares! I really wanted a little mirror for one of the shelves on this cabinet and Hobby Lobby has the perfect sized mirror and it has a yellow frame around it! I bought a special frame holder for it, so it sits and just the right angle. Then I have a tall vase and a cute little white pumpkin on this shelf, too! I really want to try to mix in some of the seasons on this shelf, so with the fresh cuttings and perhaps I can change out this pumpkin for some other small item for Christmas. 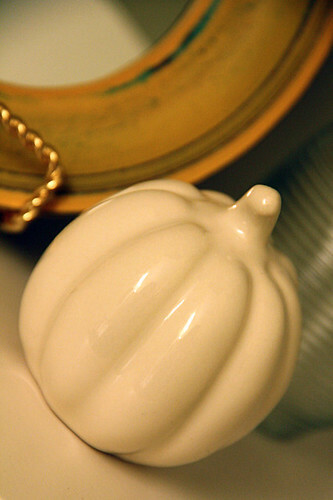 This white ceramic pumpkin is actually a salt shaker that I found at Target! Ha! Isn’t it perfect? I love getting ready in the morning and seeing all of these pretty items on the shelf! I hope this helps you with your current or future shelf/basket decorating project. Most items were $5.00 or less.